A total of 3,155 Union soldiers died at the Battle of Gettysburg at the beginning of July, 1863. Among the first was Eddie Pickett, who was killed on July 1. He was 28 years old and left a wife and two-year-old son. Unlike most victims, however, his name survived long after most others were forgotten. Edwin Darling Pickett was born in Ridgefield in 1835, a son of Rufus H. “Boss” Pickett and his wife, Betsey Parsons Pickett. His father was a noted furniture-maker in town; his first shop was on Main Street, opposite today’s Christian Science church, and he later worked from a building on Market Street. In 1857 Edwin Pickett married Sarah Chickering Harrington — a descendant of a Revolutionary War captain — in Taunton, Mass., and four years later, they had a son, Edwin William Starr Pickett. 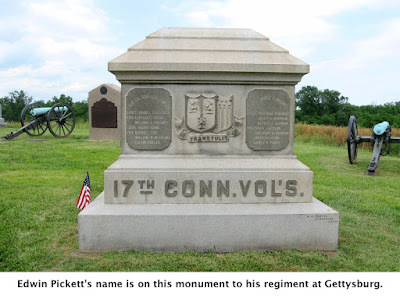 Described by a friend as a “taciturn country lad,” Pickett was working as a clerk in the early 1860s when he enlisted as a corporal in the 17th Regiment from Connecticut in August 1862. 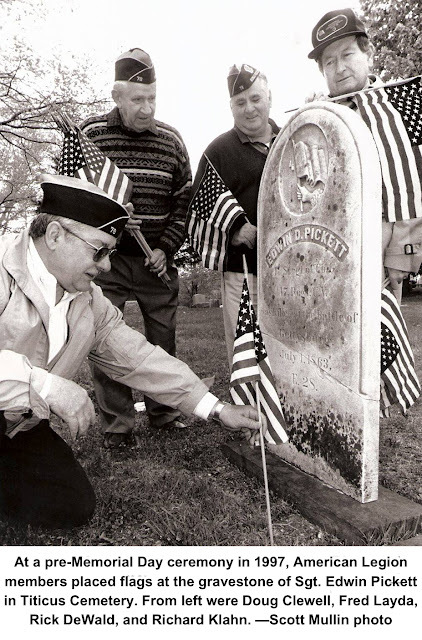 After the war ended, Ridgefielders formed a post of the Grand Army of the Republic (GAR), the equivalent of an American Legion for Civil War veterans. Among the founders was Aaron W. Lee of Farmingville. A close friend of Pickett, Lee was also at Gettysburg, was with Pickett in the battle at Barlow’s Knoll, and was wounded at the same time. Lee woke up to find his buddy lying dead beside him. Among the speakers at the gathering was Attorney Rufus Starr Pickett of New Haven, who 21 years earlier had searched Gettysburg for the body of his heroic brother.